South Coast artists, Mirabel Fitzgerald and Mark Ward have just spent three days at our studio making new etchings and editioning large linocuts. 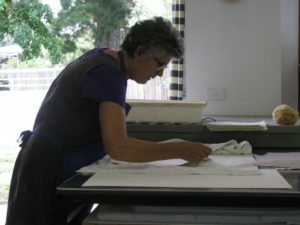 Experienced artists like Mark and Mirabel often visit Braidwood to access the aquatint box, the photo etching facilities, the big Hilton press and my assistance, when required. The only cost to you is any of my time (calculated over a Dojo pie at lunchtime) and any materials you use. Give me a call if you’d like to access Basil Hall Editions or organise a group of 4 to do a workshop here.